While no one wants gum disease—also known as periodontal disease—it can be easy to ignore if you believe that it only impacts your gums. However, that’s only what the early stages affect. Untreated gum disease has a far more significant impact on your entire body, so it’s important you understand before you decide to wait to schedule your next Bridge Creek Dental visit. Bad breath – We’ve all had bad breath, but when you have gum disease, the bacteria can cause perpetual bad breath that can’t be gotten rid of without addressing your periodontal disease. Change in teeth position – As your gums become more swollen and damaged by the gum disease, your teeth can start to shift from their normal position. This shifting can cause issues with your bite, lead to gaps, and other issues. Tooth loss – Gum disease can cause the nerves in your teeth to become infected and die, resulting in the loss of your teeth. You will likely see your teeth start to shift and become loose before you reach this point, so watch for those signs and take them seriously. Jawbone density loss – Periodontal disease can also quickly spread to your jawbone, destroying the bone. The resulting bone density loss can cause changes in your facial features and also cause your teeth to fall out. Abscess – You can also develop dangerous pockets of infection in your gums. These abscesses are especially risky if the built-up toxins reach your bloodstream, as it can make you critically ill and potentially lead to death. As gum disease can be painless, it is important that you keep an eye on these other oral health impacts. That way, you can come into our dental clinic and have your gum disease treated. Your white blood cells are a key part of your immune system and work to destroy infections as well as harmful bacteria. But when gum disease takes a serious hold on your system and spreads beyond your gums, your white blood cells can become overwhelmed. It can reach the point where your white blood cells are being destroyed by the high load of gum disease pathogens. With your white blood cells out of action or severely reduced in volume, you can become more prone to infectious disease from the common cold to more serious infections. One of the functions of the liver is to reduce inflammation in your body, and gum disease can be the source of serious inflammation. In response to the threat of gum disease inflammation, your liver can put out an enzyme that can help address the issue. Unfortunately, this same enzyme can also increase your risks of having cardiovascular problems such as strokes and heart attacks. 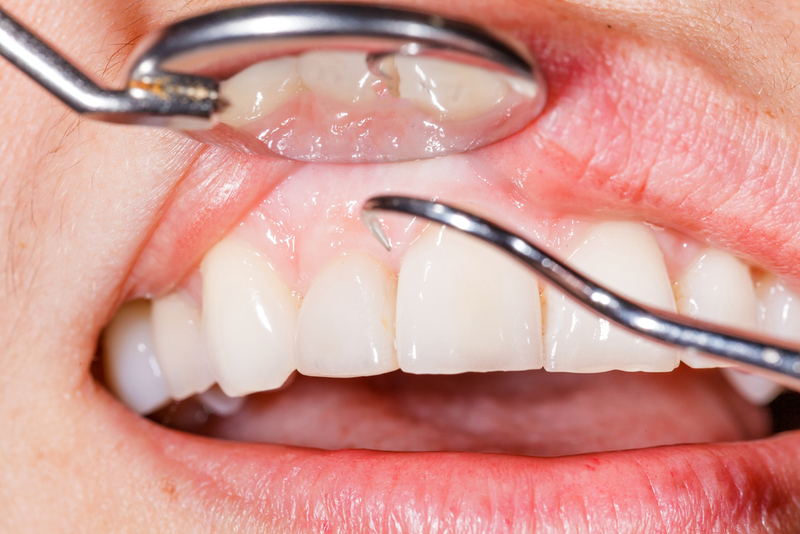 In a surprising new study on the connection between dementia and gum disease, scientists found that the pathogen which makes up periodontitis was found in the brains of patients’ with Alzheimer’s disease. Not only was the disease present in their brains, but when it was studied in mice, the presence of the gum disease pathogen added to the production of amyloid plaques. As amyloid plaques are a key factor in the cognitive decline in Alzheimer’s patients, this connection between the two diseases is very concerning. 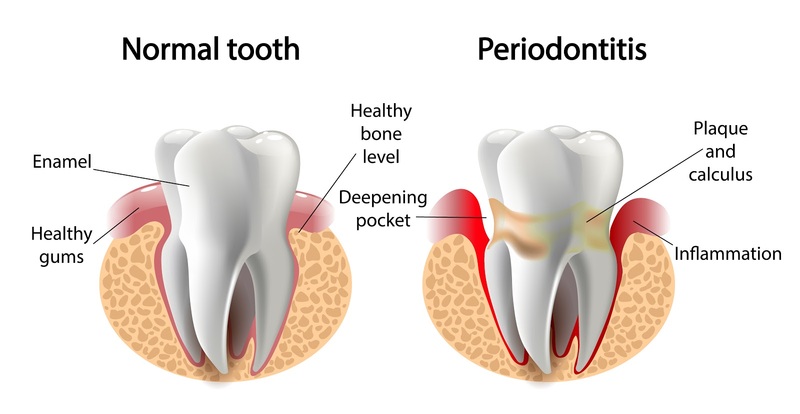 By preventing periodontal disease from gaining a foothold in your life, you can better protect you from many of the connected health concerns. Come in for biannual dental cleanings – Coming into our dental clinic for regular, preventative dental care can be one of your biggest protection against gum disease. With your twice a year cleaning and check up, our dentists can catch the beginning signs of gum disease and help effectively treat the problem. Floss daily – By flossing in the evening, you can remove all the small food particles that have built up during the day that brushing is unable to remove. There are many types of flossing tools available to make flossing easier, so if you haven’t had much success with other types of flossing, you can ask our dentists about other tools. Brush at least two times a day – Brushing in the morning removed the film of plaque which developed as you slept, while your evening brushing keeps from having food particles sit in your mouth overnight. Without these particles to eat, the bacteria which lead to gum disease will have nothing to eat and harm your teeth with. Avoid nicotine use – Using nicotine, whether you chew, vape, or smoke, can hide the early signs of gum disease, as nicotine restricts blood flow. We recommend you cut nicotine out of your life so any gum disease symptoms can be quickly detected. To start taking better care of your oral health—as well as the health of the rest of your body—contact us for an appointment today. Our dentists are ready to make sure your smile is as healthy as possible. Understanding Your Teeth: Are Your Crooked Teeth Genetic? For people who dislike their crooked or misaligned teeth, an age-old question comes to mind: “Is the problem due to nature or nurture?” The answer is, it can result from either factor. In the meantime, let’s talk more about various types of crooked teeth and their potential causes. When you have crooked or misaligned teeth, it’s known as malocclusion. 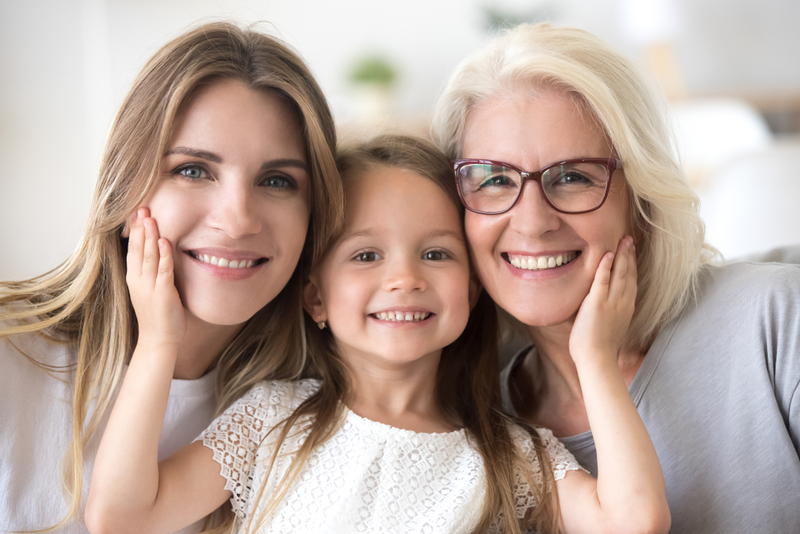 If your parents have malocclusion, there’s a good chance you do too. One of the main contributors to malocclusion is the size and shape of your jaw. If you doubt these characteristics are controlled by genetics, take a gander at famous father/son look-alikes like the cleft-chinned Kirk and Michael Douglas and the long-jawed Donald and Kiefer Sutherland. If a small jaw is your genetic legacy, your teeth are likely to be crooked because of overcrowding. You can also inherit a misaligned jaw, where the size of our upper and lower jaws differ significantly. This leads to abnormal bite patterns that range from harmless to problematic. Abnormal bite patterns can be mild, as when your upper teeth slightly overlap your lower teeth. This may cause no physical problems and even add to a person’s charm. Take, for instance, noted beauties Eva Mendes and Julia Roberts. Both have smiles marked by slight overbites, as well as white and regular teeth. There are other genetic factors besides your jaw that can lead to crooked teeth. Among these is the presence of extra teeth. Hyperdontia is the growth of extra teeth beyond our usual 20 baby teeth and 32 permanent adult teeth. Extra teeth can come in many forms, from complete teeth to ones that are malformed. They can take root behind or near your regular teeth. Whatever your hyperdontia looks like, the resulting overcrowding makes for crooked teeth. Sometimes a dentist or orthodontist will pull one or more extra teeth. This can take uncomfortable pressure off a patient’s jaws and gums and allow the regular teeth to thrive in a roomier environment. Common childhood habits like thumb-sucking and prolonged use of a bottle or pacifier use can cause or exacerbate an overbite. Other behaviors that can lead to malocclusion include the tendency to thrust your tongue behind your teeth. You may have thought you had to grin and bear it when it comes to your crooked teeth or misaligned jaw. In nearly all cases, though, malocclusion can be corrected through cosmetic dental procedures or orthodontia like braces. Want to discuss how you can correct a problem or simply beautify your smile? Contact us for your appointment today. Dentists, and parents, never approach the process of pulling a baby tooth lightly. Kids feel a great deal of apprehension about tooth extraction, even at a family-friendly office like Bridge Creek Dental. This fear may be exacerbated by tooth pain they’re already experiencing. Sometimes, though, tooth extraction is unavoidable. Your child’s primary tooth may be so badly decayed even a root canal can’t save it. It’s a common scenario, given 20 percent of children between age 5 and 11 have at least one untreated decayed tooth. Baby teeth may also need to be pulled if they’re fractured beyond repair; your child’s mouth is too crowded; a stubborn baby tooth refuses to make way for an erupting secondary tooth; or in preparation for getting braces. While a tooth-pulling is never cause for celebration, a good dentist will work to make the procedure as painless as possible. There are also a number of dos and don’ts for parents when it comes to handling damaged baby teeth, which can lessen your child’s fear and discomfort. Do explain the tooth-pulling procedure to your child ahead of time. Talk to your dentist so you know exactly what the procedure and recovery will look like, step-by-step. This includes any pain-killing measures, like numbing with a generalized anesthetic or sedation via laughing gas or an IV. It’s unlikely your child will be completely at ease about tooth extraction, but being in the know will ease their worry. Don’t panic. If your child is experiencing severe tooth pain or has damaged their teeth through a mishap, do your best to remain calm. Your composure can reassure a frightened kid. Dentistry has become increasingly advanced and children are often more resilient than we think. Childhood dental issues can usually be resolved without any lasting physical or emotional damage. Do consult with your dentist to find out how to prepare for the procedure. They may advise you to avoid giving your child food or liquids for a certain amount of time before the scheduled tooth-pulling, especially if sedation is involved. Don’t ignore your child’s tooth decay because “they’re just baby teeth” and your child will get replacements soon. Tooth decay should always be addressed, because the infection involved can put your child’s health and even their at risk. An unresolved tooth infection can also spread to adult teeth that have yet to erupt. Do plan ahead for the period immediately after the procedure. You’ll want to have over-the-counter pain medication at the ready as well as some soft foods that feel good on a sore gum. 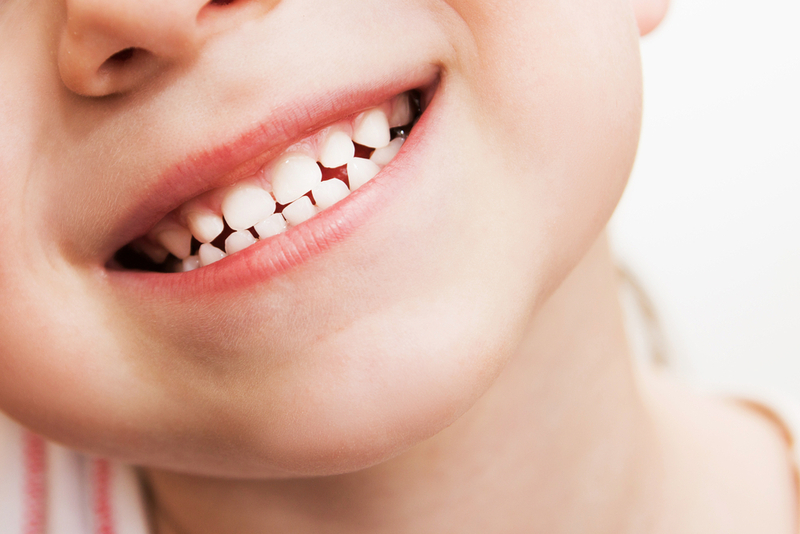 Don’t assume your child’s damaged tooth is beyond repair. A knocked-out tooth may be successfully re-implanted if you get to a dentist within a couple hours. Save the tooth, keep it moist and call you your dentist. If it’s after-hours, you may be able to schedule an appointment with an emergency dentist. Trying to save a knocked-out tooth is particularly important if your child is younger than three or they’ve managed to dislodge a permanent tooth. If your child’s tooth is knocked loose rather than knocked out, it can generally re-implant itself into your child’s jawbone. Give your dentist a call as soon as possible. They may recommend giving your youngster a soft diet for a couple days and that you make an appointment to have X-rays taken. Do prepare to be surprised at how easily your child rolls with the punches. If you had your front two teeth knocked out, you’d be beside yourself. You’d worry about the way you look as well as complication with routine activities like eating. Whether you’re in need of a tooth-extraction or just some sound advice, our dentists and staff are ready to help you. Contact us today. Gingivitis is a mild form of periodontal disease that presents itself as irritation, redness and swelling on the gingiva, the portion of your gums around the base of your teeth. 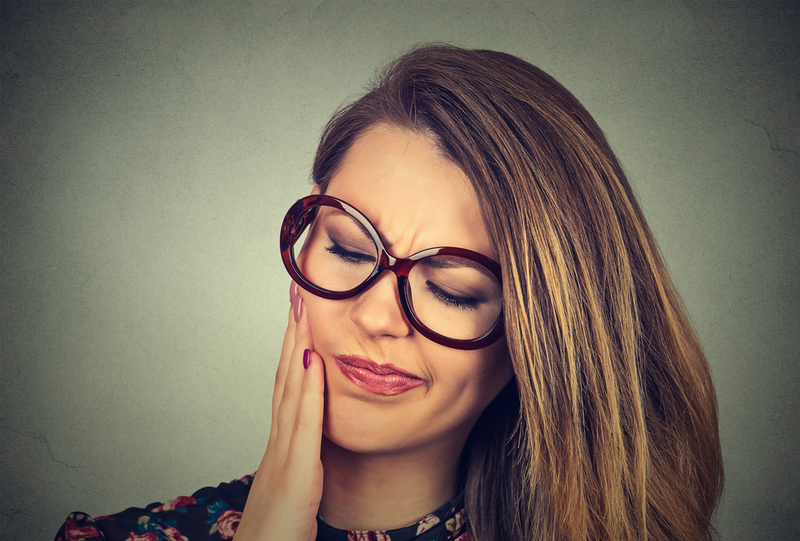 It’s an uncomfortable condition that should be addressed as soon as possible because it can lead to more serious gum disease, tooth decay and even tooth loss. If you suspect you have gingivitis or any other issues with your teeth and gums, you should see your local dentist to nip the problem in the bud. There are also measures you can take at home to ward off gingivitis. When your gums are in good shape, they should be a pale pink color and fit firmly around your teeth. Gums with gingivitis, by contrast, have a red hue. Your diseased gums are likely to be tender, recede from your teeth and may bleed when you brush or floss. Further, gingivitis can cause bad breath. The most common reason people get gingivitis is poor dental hygiene, but it’s possible for someone who’s conscientious about brushing and flossing to fall prey to gum disease. 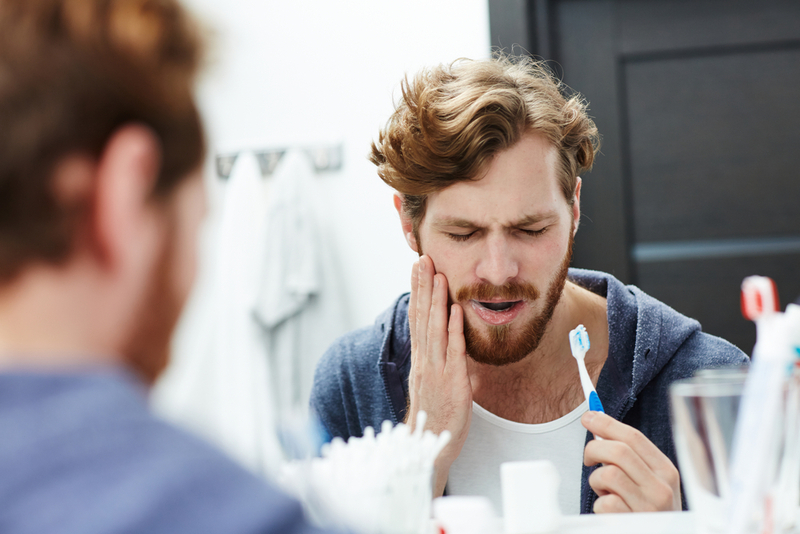 Some people are genetically predisposed to gingivitis, while others develop it after taking certain pharmaceutical drugs or contracting a viral or fungal infection. Gingivitis starts when plaque builds up and hardens into a crusty deposit called tartar. Tartar provides a breeding ground for bacteria and also irritates your gum-line, which can lead to inflammation of your gingiva. The best treatment for gingivitis is professional dental hygiene care. Your dentist or oral hygienist will scale your teeth and conduct root planing on any exposed roots to remove plaque, bacteria and tartar. Your teeth and gums will also be examined to detect if there are any other problems that need to be addressed. The best treatment for gingivitis is to fend it off by brushing your teeth twice a day and flossing regularly. You should also use a soft toothbrush and get a new one every three to four months— earlier if the bristles look worn and frayed. Some people find an electric toothbrush is better at getting rid of plaque and tartar. It’s recommended that you also get your teeth professionally cleaned at your dentist’s office at least twice a year. Other ways to prevent gingivitis include avoiding tobacco products; using an antimicrobial mouthwash; and supplementing brushing and flossing with the use of an interdental cleaner like a dental pick. If you want to prevent and reverse gum disease, address issues like cavities or learn how you can beautify and brighten your smile, contact us for an appointment at Bridge Creek Dental. Plenty of people with sensitive teeth expect that their teeth will react to hot or cold drinks and food. However, cold weather can hurt the teeth of those who don’t have sensitive teeth. Our dentists at Bridge Creek Dental wanted to help explain why your teeth may hurt in colder weather and how you can fix the problem. While our teeth have some protection from the elements, when our teeth are exposed to exposed to the cold, they contract in response. Heat has the opposite effect and makes our teeth expand. This contraction and expansion can cause small cracks in our enamel, leaving bacteria an area to gain a foothold. It can also work cavity fillings and dental crowns loose, leaving you in need of replacement. Setting up one of your bi-annual preventative dental cleanings during a winter month is a great way to catch these issues before they become too serious. Sensitive toothpaste – A simple fix you may want to try is switching your toothpaste to specific sensitive toothpaste, which will help protect your teeth from changes in temperature. Sealant treatment – If receding gums are behind your teeth sensitivity, our dentists can help by offering sealant treatment. The sealant will be applied to the exposed roots of your teeth and will help protect your teeth against both tooth decay and cold-sensitivity. Cavity fillings – Replacing your cavity fillings may correct your dental sensitivity. As dental fillings don’t last forever, it is important to have them periodically checked and replaced, which our dentists can do for you. Flouride application – Another way to strengthen your teeth against both cold-sensitivity and tooth decay is with fluoride applications, which adds a strengthening natural mineral to your teeth to boost your enamel’s protection. Our dentists can easily provide you with an application of fluoride and recommend toothpaste with high concentrations of fluoride. 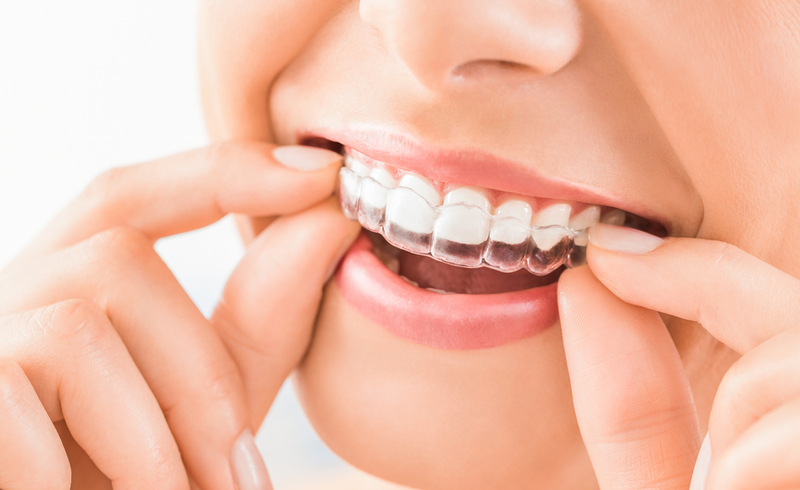 Mouthguard – If your teeth are sensitive due to being worn down by grinding them, our dentists can fit you with a custom mouthguard to protect your teeth. 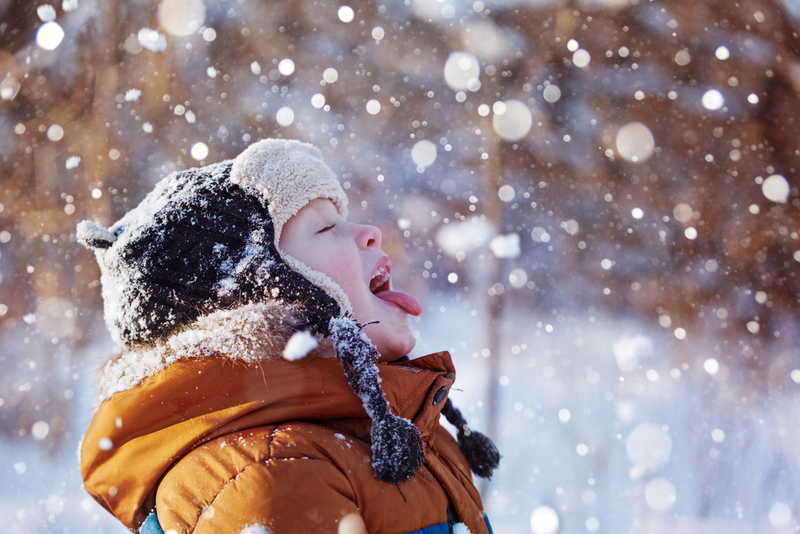 Without the grinding motion to continually expose the dentin, you should have less sensitivity to cold weather. Bridge Creek Dental is dedicated to providing top-quality dental care in Billings, MT. So, if you are looking for a reliable dentist who can help you with all your dental needs, contact us today. 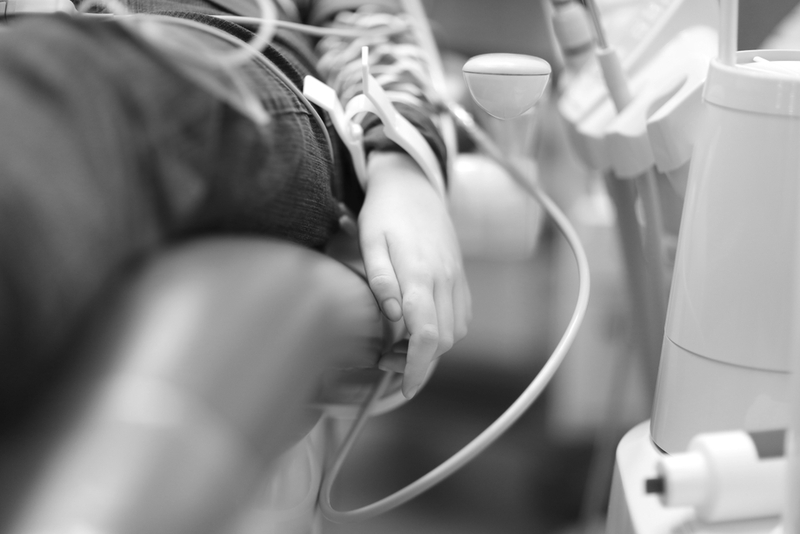 When Should You Consider Sedation Dentistry? 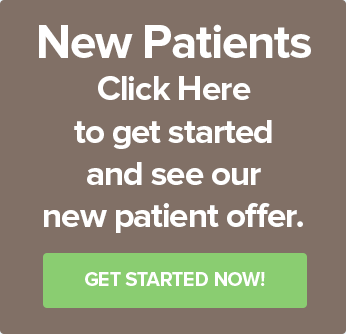 Sedation dentistry exists to help people manage their issues with the dentist. There are several levels of sedation dentistry—minimal, moderate, and deep—so everyone can receive the help they need. Here at Bridge Creek Dental, we offer sedation dentistry to our patients to help make their dental appointments easier. Whether they struggle with dental anxiety or have physical restrictions which makes a dental appointment nearly impossible, sedation dentistry can help. Dental anxiety is a real issue for many people, especially those who have previously had bad experiences with other dentists. With just minimal sedation dentistry, you can relax as you have your dental work done. This level of sedation is considered safe for young children, and often can help them overcome their initial fears concerning dental checkups and cleanings. Whether or not your child can undergo sedation dentistry will be determined by their age and weight, so be sure to talk to our dentists if this is an option you would like to explore for your child. Also, if you choose minimal sedation for your dental appointments, you can drive yourself home after your visit to our office and not have to worry about who will pick you up. It can physically and emotionally taxing to undergo multiple dental procedures such as two or more root canals back-to-back. Some people can become more anxious as time goes on while others who have smaller mouths can begin to feel sore and tense up. With minimal-to-moderate sedation dentistry, you can more easily sit through multiple dental procedures. However, with moderate sedation dentistry, you may be a bit groggy afterward and need help going home. For some dental patients, oral sensitivity can’t be blocked out with local anesthesia. To avoid any pain responses during your dental work, minimal sedation can be used to take that last bit of painful feedback away. If you struggle with sitting still for long periods of time due to physical limitations such as restless leg syndrome, Parkinson’s disease, or other issues, sedation dentistry is a good option to explore. Depending on your needs, our dentists may offer anywhere from minimal-to-deep sedation dentistry to help you through your appointment. So, if you would like assistance with your dental struggles, inform us when you contact us for an appointment. Our dentists will be happy to make the process easier for you.